It was a chilly and mild day in Seoul when G.O and his MBLAQ brothers took leave to Tokyo on 5 December 2013 for their Global Sensation Encore show. 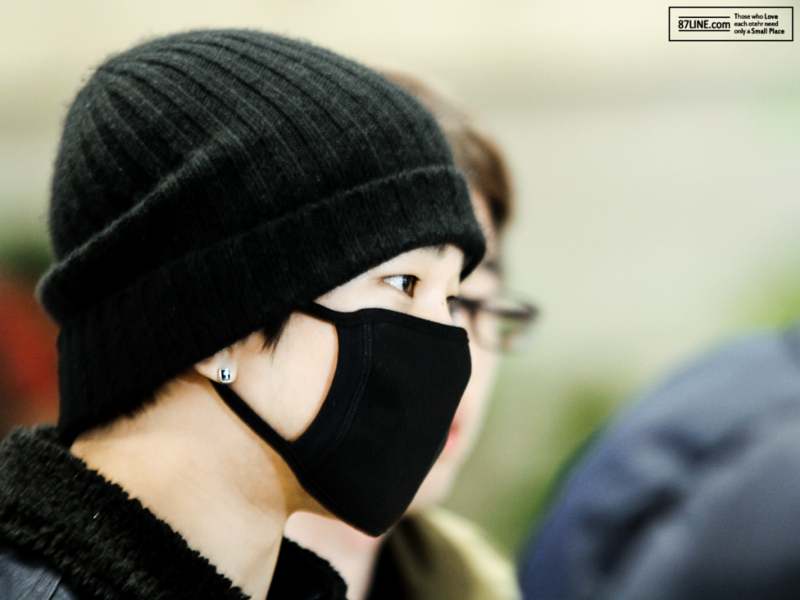 Sporting a jet black beanie and matching face mask, G.O was all casual, cozy and comfort as he made his way through Gimpo. And while it is true that the studded hi-tops he was wearing made his ensemble pop, my favorite thing he wore that day were his warm (and gorgeous) eye smiles. G.O’s eye smiles are always a thing of wonder to me. Perhaps it is because the very first time I ever met him in person, I experienced those eye smiles first hand. He was hoodied and masked and all I could see were his beautiful eyes. From that moment on, I always believed that if the smile reached G.O’s eyes, he was genuinely happy. At Gimpo back on 5 December 2013, G.O was all kinds of happy for it seems that many of the photographic captures I have seen of him that day were replete with warm, sweet and sincere eye smiles. Before I get completely swept away by his eye smiles, I do want to pause for a moment to comment on G.O’s attire. We are accustomed to seeing him in black jeans paired with a black t-shirt. That combination is as much as a crowd favorite as it is his. But I would like to call attention to the faux fur collared Lacoste denim jacket he was wearing. It looks so cozy. It looks warm, probably feels warm and no doubt is keeping him warm. But it is not all about warmth in the sense that a jacket, sweater or hoodie are insulated outer wear. No, it is more like G.O makes them look warm. I get this feeling moreso when he is wearing a hoodie, but I am feeling it from this jacket as well. The deep rich denim color maybe be a cooler hue on the color spectrum, but the faux fur collar gives it a cuddly feel. Gives it warmth. Add in the eye smiles and well, the temperature is bound to go up. Finally, the truest testament to G.O’s overall warmth, the way he appreciates his fans. Categories: G.O Military Discharge, MBLAQ Musings, The G.O Files | Tags: Eye Smiles, G.O, G.O at Gimpo, G.O in Japan, G.O Wearing Lacoste, G.O's Airport Style, G.O's Eye Smiles, G.O's Fan Service, Global Sensation Tour Encore Japan, 정병희, 지오, Jung Byung Hee, Jung Byung Hee images, Lacoste, MBLAQ Fan Signs, MBLAQ G.O, MBLAQ G.O at Gimpo, MBLAQ G.O images, MBLAQ G.O in Japan, MBLAQ G.O's Airport Style, MBLAQ G.O's Eye Smiles | Permalink.